After spending the winter in Florida, we are slowly making our way up the east coast as Spring emerges and turns into Summer. First, let’s backtrack to where we left off. We got off to a great start to 2007 with the return of our two-foot tall pal, Hike. As you might recall, he had returned for the holidays to the Louisiana headquarters for Happy Campers. He apparently had a great time helping out in his Santa suit. We spent the holidays and the winter in Florida visiting family. We spent part of that time near Orlando at our Thousand Trails RV park. We also spent time over at Lazy Days, a huge RV dealer in Seffner, Florida. 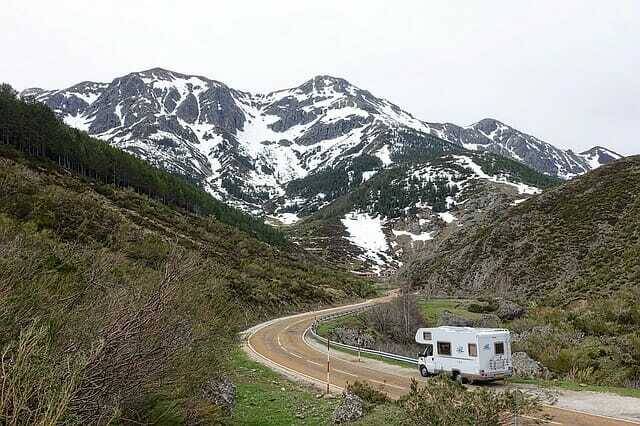 We had purchased our motorhome here several years ago and were now here for some RV service. When Hike arrived, we were staying over at Lazy Days and using some of the free perks we received when we made our purchase. Our type of RV had qualified us to be part of Crown Club – which gave us benefits such as coupons for free stays at Rally Park, an RV site (with WiFi) at the Crown Club while we were having service work done, and use of the Crown Club swimming pool and clubhouse for complimentary breakfast, lunch and cocktail hour. We hadn’t had much chance to use these perks in the past several years — so we decided to take advantage this time around. It was Hike’s first visit to Lazy Days, so he was pretty amazed with the size of the dealership. He enjoyed walking into all the RVs and said he didn’t even miss hiking since he was walking so much! He made up for it – we all did- with the food at the Crown Club. And in case that wasn’t enough, there was always the Strawberry Shortcake over at Parkesdale Farm in Plant City. This is a well-known destination in the area. Usually people are lined up to get their large and reasonably priced serving, according to their own preference (with ice cream or without, berries with sugar or without, etc.). You can also purchase produce and plants at the popular Parkesdale Farms. We have previously noted some of our tips for RV service. One thing we have learned from past experience is to take things with us when we leave the coach in the morning. The coach could be gone all day and might not be accessible to us. So depending on our plans for the day — we might take the laptop or bathing suits and shower stuff, maybe a good book or a list of phone numbers to make some necessary phone calls, and so on. Another thing we try to prepare for, mentally, is that our fulltime RV home is going to be a bit disheveled. When the RV is due to go into the service bay from day to day, we tend to keep more stuff stowed. There are likely to be floor coverings scattered about. If there is a chance that service personnel will be trekking inside, we make sure the couch and floors are covered to avoid getting the interior dirty or marked up. In the grand scheme of things, these are minor inconveniences. The bigger lessons we have learned have to do with having clear expectations and keeping tabs on progress of the RV service work. While we were in the area, we got to the Florida RV Super Show in Tampa. Huge show with tons of RVs of all kinds and brands. We saw big and small motorhomes, million-dollar luxury coaches, trailers, fifth wheels, pop-ups and gear haulers. In addition to all the RVs, we saw a gigantic sand sculpture, bagpipes, harmonicas, clowns, Teddy Roosevelt, a tall cowboy with his lasso and a mime. AND we met Radar from the TV show M.A.S.H. – really, Gary Burghoff was there in person! He is quite an amiable guy and seemed genuinely pleased to meet Hike! While the big RV show was going on, the Crown Club hosted some theme nights at happy hour. One night was a Jimmy Buffett theme with music and food. And one night was Mardi Gras, with music, beads, gumbo, a cajun shrimp boil and bananas foster! A few weeks later, we spent a day at the Florida State Fair. The festivities included a small parade, plenty of rides and some bands playing music. We got to see Circus Hollywood, a menagerie of giraffes and llamas, a pedigree dog exhibit, arts & crafts and a lot more. Hike kept up his blog about these events. After Florida, we were back on the road in March. First was the Country Coach East Coast Reunion/Pre-rally. It was held in Jekyll Island, Georgia, and we had a front row parking spot overlooking the ocean! It was good to see the Atlantic coast once again, after a couple years. We got out to see the area, and enjoyed some great food and entertainment at the rally – More on Jekyll Island and Country Coach rally. Then we were off to Perry Georgia for the FMCA Convention. This was the first time we had attended the Perry convention and the weather was perfect (compared to some past years when there was a lot of rain). There were a lot of seminars, an early morning exercise class, a ton of display coaches, vendors and excellent entertainment. There was more to do and see than we could fit in! Oh well, there’s always next time…we always have a great time at the FMCA rallies. The fee to attend the FMCA Convention is very reasonable (about $100) for all you get. Of course, we do seem to get tempted to buy something new for the coach. This time around it was an upgraded SmarTire system, which monitors the temperature and pressure of all the tires on the coach and the tow car. We think it’s a wise investment! After these rally days spent dry camping, we then treated ourselves to a little luxury at the Hilton Head Motorcoach Resort. Here we enjoyed a beautiful full hook-up site with 50-amp service, in a lovely park that is associated with the Outdoor Resort network. Great weather, some time at the beach, bicycling and some good food. We also took a side trip over to Savannah and Tybee Island. Our travel in South Carolina continued with a week in the laid-back Low Country near Beaufort. We stayed at one of our RPI RV Parks and used that as a base to explore some of the Sea Islands. Next stop on the coast was beautiful Myrtle Beach. We stayed at the southern end of the strand, south of Murrells Inlet at Huntington Beach State Park. A great location to enjoy nature and an unspoiled stretch of beach, yet close to all the action of Myrtle Beach. We will be continuing up the East Coast in the coming months. More to follow. Video: How we got started with Your RV Lifestyle site. Check out Your RV Lifestyle Store. Get some RV books to plan your travel or lifestyle. Plus a whole bunch of other products.